We want to provide you with tons of great options! Our premium line of Ella’s Bubbles products will be sure to be the centerpiece that can take any bathroom from great, to phenomenal! We offer one of the largest selections online of contemporary walk in tubs with warm air hydrotherapy. Senior bathtubs don’t have to look plain or boring. They can be incredibly beautiful and make taking a bath, something you look forward to everyday. Not to mention the jetted, water foot massage feature! Click here to learn why walk in bathtub conversions make sense. What Style Of Contemporary Walk In Tub Is Right For Me? Aging Safely carries a wide variety of contemporary walk in tub products. All of our bathtubs are made with safety in mind. But how do you know which one is right for you? You will want to take into consideration several important factors. When buying a walk in tub you will want to consider things like seat height, jetting options, warranties, step in height, internal seat width and installation size parameters. We can help you find the best walk in bath for you. Our representatives are standing by to answer in questions you have. Click here to get started. What Size Walk In Bath Tub Is Right For My Body? Finding the right walk in tub for you entails thinking about its general purpose and your overall preferences. 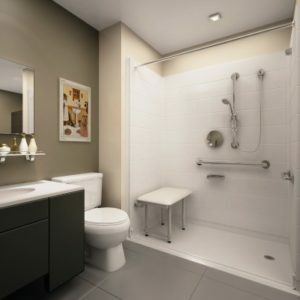 Not only does the handicap bathtub need to fit through the doorway and bathroom to be installed, you also want to make sure your body size is conducive to the tub. Not all people will fit into all walk in tubs. You will want to determine the internal seat width and compare that to your hip area to make sure you fit. Then you will want to measure from elbow to elbow, with arms hanging down naturally. Take that width and compare it to the internal width of the walk in bath. Furthermore, you shouldn’t get a bath that’s too big or too wide for you, as the extra space could make it more difficult for the bather to remain stable on the seat. These are examples of important questions for to think about and discuss with one of our handicap bath consultants. Or Click here if you think a walk in shower would be better for you.